Wilts & Berks Canal Amenity Group. Neil recently retired from active service after 23 years of devotion to the cause. As a reward for his insight and enthusiasm Neil was honoured with the position of Vice President of the Group, and is now known as its ‘Founder and Vice President’. There have been many mentions of Neil’s exploits in past editions of Dragonfly. This one, I hope, will give a greater insight to the life of the man who started it all, all those years ago. Neil was born in Lydney, in the Forest of Dean, Gloucestershire, and spent most of his childhood years in Essex. He studied botany at the University of Wales in Aberystwyth, finally graduating with an Honours Degree in that subject. His teaching career began at a school near Mold in North Wales, but after a year or so Neil returned to Essex where he taught for some twenty years before moving to his present job at an independent college in Rochester. Of his current job Neil says, “Working in an independent college involves longer hours but also has the advantages of smaller classes and fewer regulations and restrictions”. It was while teaching in Essex that Neil met and became friends with Chris Toms, now our membership secretary. At sometime in the early-to-mid seventies, at the suggestions of a pupil, Neil and Chris organised a school canal cruise. From this Neil began to develop an interest in canals, and in particular the Thames & Severn Canal which he was already aware of from his train journeys to and from Lydney to visit his grandparents. Neil joined the Stroudwater, Thames & Severn Canal Society (now the Cotswold Canal Trust). He eventually became their Appeals Secretary and was instrumental in obtaining finance for the original restoration of eastern portal of Sapperton Tunnel. Through his work with the S,T&SCT, Neil became aware of the North Wilts Canal and its junction with the T&S at Latton. Neil pursued this with interest and subsequently discovered the Wilts & Berks Canal, learning that it was the longest un-restored canal in Britain. At this time, Neil began to correspond with Simon Rowberiy who was involved in the possible restoration of the Shrewsbury & Newport Canal. He supported Neil’s idea of forming an organisation to restore the Wilts & Berks and North Wilts Canals and subsequently the pair walked many parts of both canals in order to establish their condition. 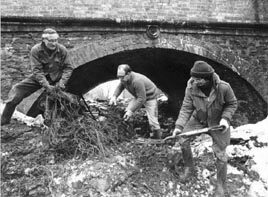 They decided it was time to move forward and the idea of forming a restoration organisation was suggested in the waterways press in the spring of 1977. The rest, as they say, is history and the inaugural meeting of the Group took place on October 8th 1977 in the Long Room of Swindon Arts Centre with the late Jack Dalby giving a talk on the W&B Canal. Neil also holds an amateur radio transmitting licence and in days gone by spent many a happy hour talking to people around the world. Neil says that, unfortunately, work commitments prevent him from getting on the air much these days. He also says that to his knowledge there were four or five amateur radio enthusiasts in the Amenity Group at one time. Languages have always held a special interest for Neil and in his time has dabbled in Russian, Italian, Spanish, Gaelic and Latin as well as the customary French and German. He says, “I have always wanted to look into Celtic languages in more detail as this ties in with the Scottish blood in my veins. My grandmother was a McNeil, hence my name, and her father originated from Barra in the Western Isles. This interest in languages, I suppose, links to a general interest in travel and the evolution of the various cultural groups around the world. Most of this information is unfortunately accessed through reading rather than visiting, although I have travelled widely in Europe and parts of Africa but have not as yet had the opportunity to go further afield”. Neil also has an interest in railways and is a life member of the Forest of Dean Railway, which operates close to his birthplace in Gloucestershire. Throughout his involvement in the W&BCAG Neil has, at one time or another, held a handful of key posts including; Membership Secretary, Treasurer, Editor and Chairman. Because of Neil’s farsightedness and his ability to convey his enthusiasm to others, the Wilts & Berks Canal is now one of the most prominent canal restoration projects in the country.